(Phys.org)—The large amount of waste heat produced by power plants and automobile engines can be converted into electricity due to the thermoelectric effect, a physics effect that converts temperature differences into electrical energy. Now in a new study, researchers have confirmed theoretical predictions that two-dimensional (2D) materials—those that are as thin as a single nanometer—exhibit a significantly higher thermoelectric effect than three-dimensional (3D) materials, which are typically used for these applications. Previous research has predicted that 2D materials should have better thermoelectric properties than 3D materials because the electrons in 2D materials are more tightly confined in a much smaller space. This confinement effect changes the way that the electrons can arrange themselves. In 3D materials, this arrangement (called the density of states distribution) is continuous, but in 2D materials, this distribution becomes quantized—only certain values are allowed. At certain densities, the quantization means that less energy is required to move electrons around, which in turn increases the efficiency with which the material can convert heat into electrical energy. 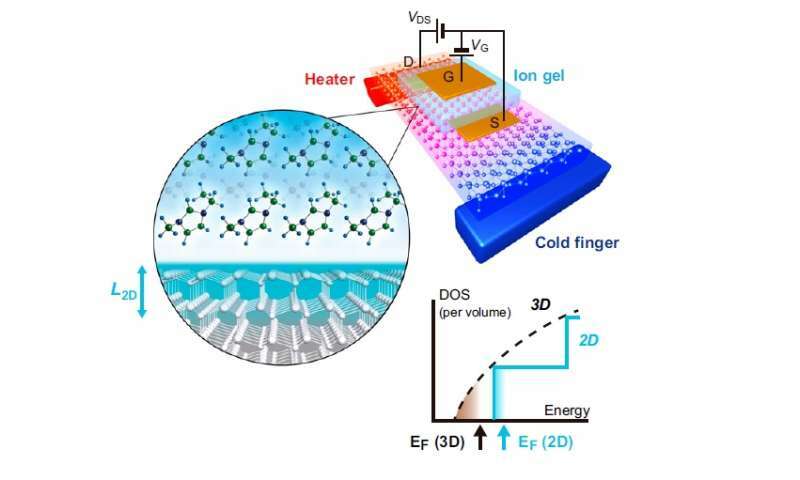 Experimentally demonstrating this thermoelectric enhancement in 2D materials has been challenging because of the difficulty in fabricating 2D materials with the appropriate electron arrangement. Although previous experiments have demonstrated this enhancement in certain materials, it has been unclear whether the mechanism of enhancement agrees with predictions. In the new study, the researchers fabricated a 2D electron gas on the surface of a zinc oxide semiconductor, and showed that this material's thermoelectric properties can be directly compared to those of bulk zinc oxide because both 2D and 3D versions have a single electron band. "In order to discuss the thermoelectric effect unique to 2D materials, it is very important to control the carrier density in the 2D layers," Shimizu, a researcher at the RIKEN Center for Emergent Matter Science in Saitama, Japan, told Phys.org. "Our approach, the electric field effect with ionic gating, enabled us to produce an ideal 2D layer and to control the carrier number." Using their new approach, the researchers found that the 2D electron gas exhibits a thermoelectric effect that is approximately three times larger than that of the 3D semiconductor. This enhancement ratio is about twice as large as predicted by a simple simulation, which the researchers suspect could be due to inaccuracies in estimating the thickness of the 2D layer, where even a few nanometers can make a big difference. They hope that future research will lead to more accurate approaches of estimating the thickness, providing a better measure of the thermoelectric effect enhancement. "The results of this study clearly remind us of the importance of low-dimensional materials and devices for realizing high-performance thermoelectric conversion," Shimizu said. "In the future, I would like to investigate other low-dimensional materials, including nanotubes and quantum dots."